Locked document storage receptacles are placed in your office to assist you in managing your consistent stream of confidential paperwork. You deposit sensitive material into one of our secure bins, enabling you to remain focused and productive. Once your bins are full, our uniformed professionals will empty them into our locking storage receptacles. 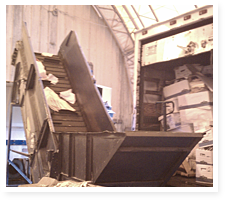 The receptacle remains locked until it arrives at our secure facility to be shredded on your scheduled date. Document Storage Receptacles are a smart, efficient and cost effective way to show your staff that information privacy is a priority.Choose any or all of our document storage receptacles to help you build a safer and more productive office environment. We here at Data-Struction paper shredding are so confident that you will love our service that we will give you 30 days to try our recurring service, risk free! 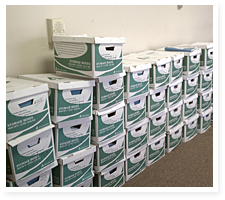 When you agree to our free trial, a uniformed Data-Struction representative will drop off a document storage receptacle at your office, free of charge, so you can see how valuable our recurring service can be to your company. We know that you will see a dramatic increase in your staff’s awareness of confidentiality, not to mention an increase in productivity. You’ll like it so much that you wouldn’t think of going back to slow, messy and noisy office shredders. Trying to shred large amounts of files with an office shredder is a disaster waiting to happen. It wastes too much time, causes a huge mess and that’s if your shredder doesn’t overheat or jam! document storage receptacles and deliver them safely to our secure site for immediate destruction. Have a project and need some time to accumulate all your paperwork? No problem, we can leave the bins at your office and you can call us for service when they are full. No job is too big or too small. Call a sales representative today for a free quote. As information technology grows, so does the need for secure destruction of media. Data-Struction is equipped to destroy an array of business and consumer products. We can shred pretty much anything! That is why we are true experts at “INFORMATION ELIMINATION”. 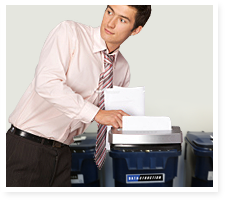 Come to our facility where you can watch us shred your documents. We accept all amounts regardless of size and prices vary on volume. No need to remove staples, paper clips, butterfly clips or hanging file folders. We accept drop off shredding every Saturday between the hours of 8:30am-12:30pm. Banker boxes are $10.00 ea. Kitchen bags are $20 ea. Black contractor bags are $30.00 ea. All drop off shredding is a witnessed shred. Data-Struction Shredding shreds more than just paper. Here is a list of additional material we can shred. Give us a call at 516-442-1624 if you have any questions.